As per TRAI data of May, 2014, though there are about 38 crore mobile telephone connections in rural areas, internet penetration in the countryside is still abysmally low (in single digit percentage). Therefore, mobile messaging is the most effective tool so far having pervasive outreach to nearly 8.93 crore farm families. 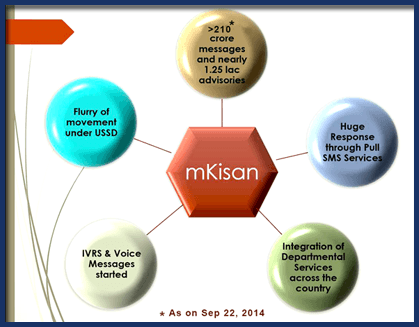 mKisan SMS Portal for farmers enables all Central and State government organizations in agriculture and allied sectors to give information/services/advisories to farmers by SMS in their language, preference of agricultural practices and location. As part of agricultural extension (extending research from lab to the field), under the National e-Governance Plan - Agriculture (NeGP-A), various modes of delivery of services have been envisaged. These include internet, touch screen kiosks, agri-clinics, private kiosks, mass media, Common Service Centres, Kisan Call Centres, and integrated platforms in the departmental offices coupled with physical outreach of extension personnel equipped with pico-projectors and hand held devices. However, mobile telephony (with or without internet) is the most potent and omnipresent tool of agricultural extension. The project conceptualized, designed and developed in-house within the Department of Agriculture & Cooperation has widened the outreach of scientists, experts and Government officers posted down to the Block level to disseminate information, give advisories and to provide advisories to farmers through their mobile telephones. 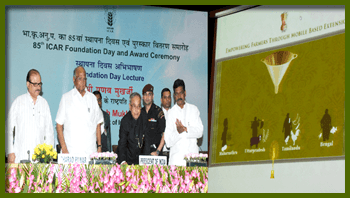 SMS Portal was inaugurated by the Hon'ble President of India on July 16, 2013 and since its inception nearly 327 crore messages or more than 1044 crore SMSs have been sent to farmers throughout the length and breadth of the country. These figures are rising ever since. These messages are specific to farmers' specific needs & relevance at a particular point of time and generate heavy inflow of calls in the Kisan Call Centres where people call up to get supplementary information. SMS Portal for Farmers has empowered all Central and State Government Organizations in Agriculture & Allied sectors (including State Agriculture Universities, Krishi Vigyan Kendras, Agromet Forecasts Units of India Meteorological Department, ICAR Institutes, Organization in Animal Husbandry, Dairying & Fisheries etc.) to give information/services/advisories to farmers by SMS in their language, preference of agricultural practices and locations. USSD (Unstructured Supplementary Service Data), IVRS (Interactive Voice Response System) and Pull SMS are value added services which have enabled farmers and other stakeholders not only to receive broadcast messages but also to get web based services on their mobile without having internet. Semi-literate and illiterate farmers have also been targeted to be reached through voice messages.